A first-of-its-kind regional partnership in Washington state seeks to develop and demonstrate the technologies to cost effectively balance energy use among buildings, campuses, and cities. Matching a $2.25 million Clean Energy Fund grant from theWashington Department of Commerce , DOE’s Offices of Energy Efficiency and Renewable Energy and Electricity Delivery and Energy Reliability are supporting a multi-campus demonstration of transaction-based energy management. The Pacific Northwest National Labs, Washington State University , and the University of Washington are teaming on the effort. 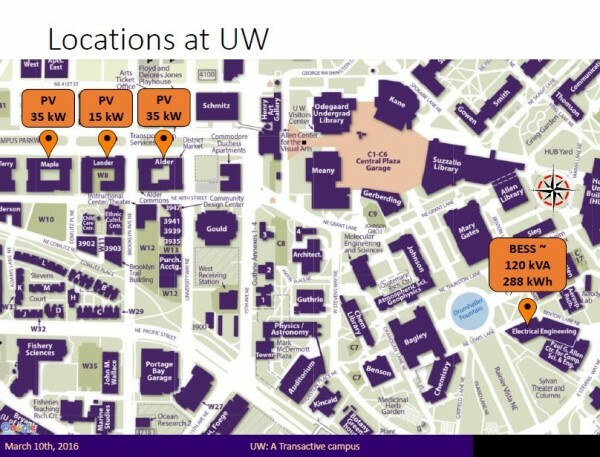 The connected campus project links solar on UW west campus residence halls with a battery energy storage system to create a transactive energy system. Energy use can be controlled on the UW campus as well as at WSU and PNNL by signals sent across the state to balance the electrical load and integrate renewable energy into the system. Below is a short Q&A with Miguel Ortega-Vasquez, UW assistant professor of electrical engineering and a lead researcher on the project. What is the UW’s role and what specific research or specialty are you and your group contributing? How does your work integrate with the other two research institutions? The core idea of the project is to create a multi-campus transactive network. That is, the energy consumption of these campuses can be controlled via transactive signals in order to respond to either local (e.g. utility level) or regional (e.g. Bonneville Power Administration level) needs. For instance, if there is abundant wind power generation, a signal could be sent to the three campuses in order for them to increase their consumption. Another example could be that, if electricity feeders to which UW is connected are being heavily loaded, then Seattle City Light could send a signal to UW to reduce its power consumption momentarily. What stage is the project now? The project is composed in several stages. Some of these include acquiring a Battery Energy Storage System (BESS) and smart inverters for photovoltaic (PV) generation that will be installed in the near future. While we have done considerable progress in this front, the design, selection, procurement, installation and commissioning of the equipment takes time, and we expect the equipment to arrive in in the Fall. Meanwhile, we have made significant progress in designing the VOLTTRON software architecture to which these devices will be connected and controlled. That is, we already have the software and control framework for the BESS and PV in an emulated environment. What insights do you hope to gain from the data and project? The PV generation will be available when sun irradiance is available (i.e. during the day). This coincides when the time that that circuits across the UW campus are more heavily loaded. The PV will be able to provide active power and local reactive power; that means we can provide additional power to specific buildings when needed and we will be able to maintain the voltages across campus within a safer operating threshold. Having access to the data on the optimal operation of the BESS will allow taking advantage of “free” PV generation more effectively, and to arbitrage energy by purchasing at night during cheap periods, and using during the day, when electricity is more expensive. Furthermore it will open the door to exploring possible coordination between other controllable buildings, in order to respond to a common objective or constraint. For example, we can create individual peak power consumption at different times of the day, in order to maintain the aggregated peak consumption of UW below a given value, which is tied to the campus electricity bill. What is the societal/economic benefit of this project? Unlocking the flexibility from the demand-side has tremendous societal and economic benefits. On the one hand, it will accommodate larger amounts of renewable-based energy generation and thus reduce carbon emissions from the supply-side, as well as reduce the total cost of producing electricity. Furthermore it will provide new stream of services in order to operate the electric grid in a more secure and efficient manner. Can a similar project be replicated outside Washington state? And, would you consider our state a leader when it comes to this type of demonstration and research? Absolutely. That is the core idea of this demonstration project. That is, we want to create “recipes” that can be easily replicated, in order to attain tangible gains, without having to make “back of the envelope” calculations or guesses of possible gains. Washington is indeed a leader in demo projects of this nature. Washington is the cradle of new paradigms to operate the electric grid via transactive signals. A few examples of this include the GridWise Olympic Peninsula Demo, the Pacific Northwest Smart Grid Demonstration Project and now the our Clean Energy & Transactive Campus Project.